Grenlec is encouraging customers to manage their electricity usage, as world fuel prices have increased the cost of electricity over the last 2 months. 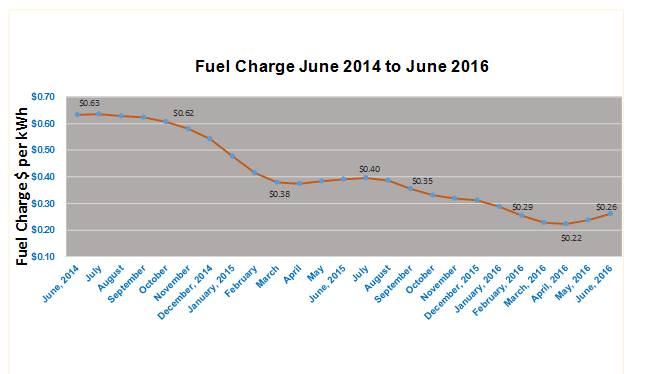 In June, customers paid 2¢ more per kilowatt-hour (unit) of electricity than they paid in May. With a non-fuel rate that has remained virtually unchanged in 22 years, this recent increase in electricity prices is due to the rise in the price of fuel on the world market. While Grenlec enjoys a marginally lower price from Petrocaribe, this price moves with changes in world fuel prices. Over the past 2 years, world fuel prices have dropped dramatically resulting in a more than 40¢ decline in the fuel charge that Grenlec has passed on to customers. The Grenlec CEO is advising customers to take advantage of energy management information provided by the Company and others, to cultivate responsible energy use habits that will serve their homes and businesses well. Mr Cover added, “Even in the future we envision of stable electricity prices from renewable energy, we will consistently tell our customers to conserve energy and preserve our environment for the generations to come. The information we are providing will help our customers make good decisions about how to get the most value for the money they spend on electricity”.